Does not need deadheading. Can take the full sun. What could be better? Normally, I wait until the end of the gardening season to report on Proven Winners trial plants. That is still the plan. But, I couldn’t wait to tell you about a new arrival. The name is a perfect match. Every time I look at this flower, I think of the name. 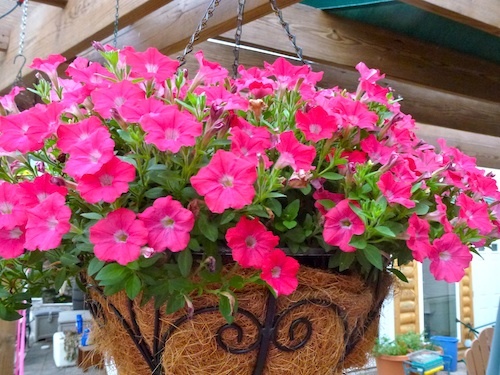 This Supertunia® is exactly the shade of pink/red that tells you its name is watermelon. Watermelon Charm is just beginning to tumble over the edges of this hanging basket. Like other Supertunias,® I expect this plant to be heat tolerant. I’m sure the bright pink blooms will attract butterflies and hummers. 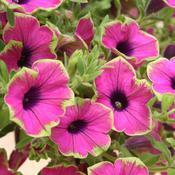 You may remember another Supertunia® standout, Pretty Much Picasso® from an earlier post. 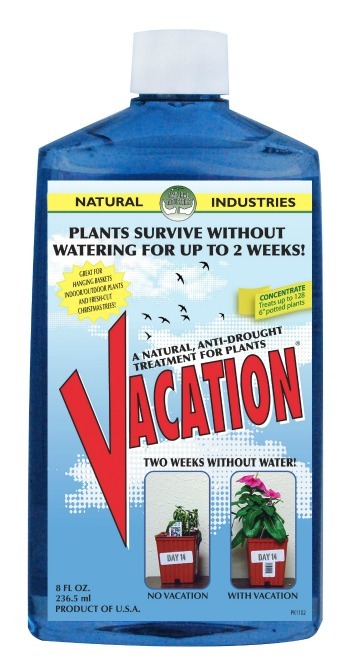 If you have a cut Christmas tree, look for a new product called Vacation. It will keep the tree green and fresh much longer. But I have to tell you how I use it – on potted poinsettia plants. Vacation is biodegradable and contains no toxic chemicals. Vacation can also be used on poinsettias and other potted plants to keep them from drying out. Just mix two capfuls of Vacation with a cup of water (or three ounces per gallon of water). Apply the solution as a watering to the entire pot until the soil is saturated. Poinsettias will then survive without water for up to two weeks. You can be the sweetheart neighbor or daughter with the green thumb, if you add this to the potted poinsettias before you give them as gifts. It will keep Auntie from overwatering her plant if you include a tag. “ Do not water this plant until: January ____.” (Over watering is what kills most poinsetties at home). Vacation, an all-natural plant anti-transpirant, will keep your Christmas tree fresh for up to three to four weeks. One 8-oz. bottle of Vacation with one gallon of water is all it takes. Vacation is biodegradable and contains no toxic chemicals. 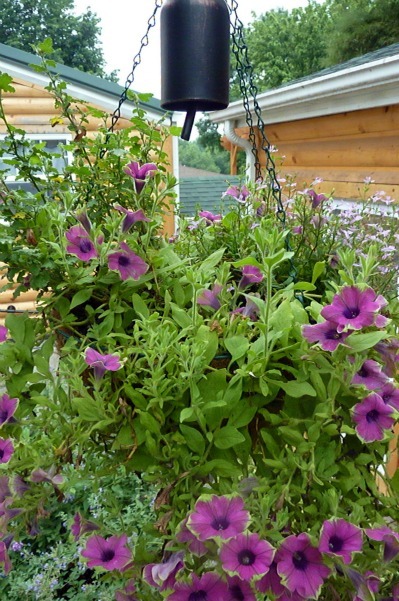 Supertunia® Pretty Much Picasso™ Petunia from Proven Winners survived a week's vacation with no water. My summer vacation is no picnic for the plants left unattended while I am away. But now they can have Vacation when I am on vacation. While you are getting the 8 oz bottle of Vacation, get an extra bottle because this product saved my container plants and a hanging basket last summer while I was on vacation. What a pleasure to come to home to blooming plants. I only tell you about products I have used and Vacation saved my plants this summer and it is now keeping the poinsettia looking a lovely as when I brought it home.